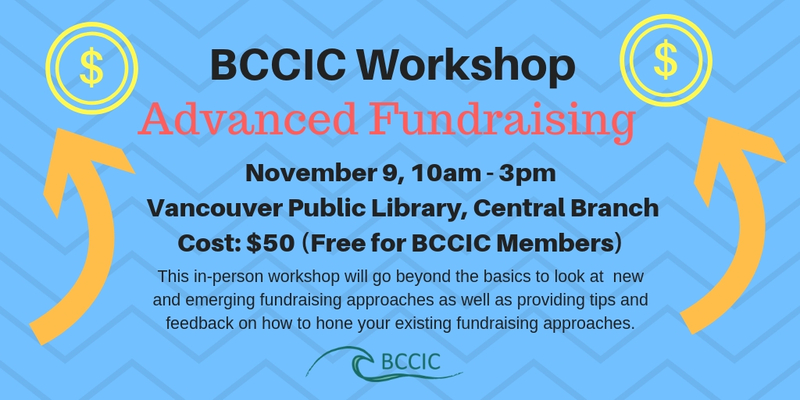 In response to member demand, BCCIC will be holding an Advanced Fundraising Workshop on November 9th from 10 am to 3pm at the Central Branch of the Vancouver Public Library. Targeting fundraising approaches for different groups e.g. individuals, corporations, nonprofits, etc. Peer to Peer examples, recruiting fundraisers and ambassadors and corporate gifts. The relative effectiveness and time intensity of the different fundraising approaches. Reality check – What can smaller organizations realistically expect to accomplish? When: Friday, November 9, 10 am – 3 pm. Where: Morris J Wosk Boardroom, 7th Floor, Vancouver Public Library, Central Branch. Cost: Free to BCCIC members, $50 for non-members (to be paid in advance). Lunch and refreshments will be provided for all attendees. For those members who are not able to attend, we will be recording the workshop and will make the recording available to all BCCIC members. President of Pharos Fundraising Strategy + Communication, RaeAnne has an outstanding track record of success with over 80 not-for-profit organizations across western Canada, raising millions of dollars through annual giving, major gift, and capital campaigns. RaeAnne focuses on capacity building and making things clear. Whether planning a fundraising program, evaluating a communications strategy, mentoring new fundraising staff, directing a capital campaign, or managing an annual giving program, her focus is for each client to become more self-sufficient and effective, and to make better decisions because they have the tools and knowledge to do so.